A couple of weeks ago I was out to the Scott-Carver Old Time Harvest Steam & Gas Engine Festival in Jordan, MN. It was a very enjoyable time. As a youngster I used to go with my grandparents to a similar event known as a Threshing Bee in Butterfield, MN. I haven’t been to Butterfield or anything like it since about the 1980’s, so it was fun to see. I plan to take in another one, the Rice County Steam and Gas Engine Show, the last weekend in August in Dundas, MN. No sooner had I gotten in the entrance gate when I spied a field straight ahead and over the loudspeaker came a voice announcing the old-time potato digging was about to start. So I headed down the hill. I have previously posted that my grandfather was a potato farmer for most of his life. 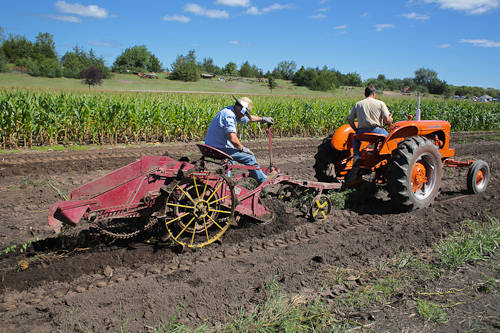 The equipment being used in this “old-time” potato digging was very similar to what he used. The potato digger could have been a carbon copy, while the tractor looked newer. My grandfather used John Deere A and B model tractors, while this was an Allis-Chalmers WD 45. As can be seen in the photo it was a bit of a lean harvest. It’s been dry around Jordan this summer, though not as dry as further South in Minnesota. 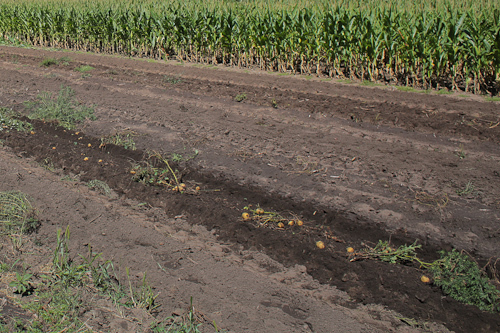 The lack of rain was probably the biggest contributor to the lack of spuds. You could bag your own, or buy them prebagged. The prebagged we’re $3/per bag. The bags were the size of those little apple bags with the two paper handles. I wonder what the. I would think you’d get at least 15 – 20 of those little bags out of the 100lb sacks my grandfather sold for $5 to $7. No matter though, these were quickly sold out. This entry was posted in Uncategorized and tagged allis-chalmers, antique farm equipment, copyright ryan ware, potato, potato digger, potato digging, potato farming, potatoes. Bookmark the permalink. I planted two potatoes in pots this year and am anxious to see what they yield. Not much garden space. I’ve been to the Rice County Steam and Gas Engine Show many times and blogger about it. If you see me wandering around with my camera, be sure to introduce yourself. Maybe see you there. Going to take my father in law on Saturday. You did better than I did. I bought some seed potatoes and never got them planted.